Somewhere between 900 and 800 BC, the Italian peninsula was settled by a mysterious peoples called the Etruscans. We don't know where the Etruscans came from, but archaeologists suspect that they came from the eastern Mediterannean, possibly Asia Minor. We will, however, never really know where they came from or why they colonized Italy. We do know that when they came to Italy, they brought civilization and urbanization with them. They founded their civilizations in north-eastern Italy between the Appenine mountain range and the Tyrrhenian Sea. Their civilization stretched from the Arno river in the north to the Tiber river towards the center of the Italian peninsula; it was on the Tiber river that a small village of Latins, the village that would become Rome, sat. 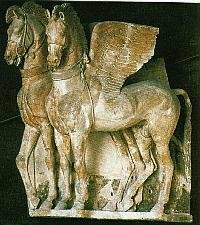 So the Romans, who were only villagers during the rise of the Etruscan civilization, were in close contact with the Etruscans, their language, their ideas, their religion, and their civilization; the Etruscans were the single most important influence on Roman culture in its transition to civilization. They were a sophisticated people, with an alphabet based on the Greek alphabet, a powerfully original sculptural and painting tradition, a religion based on human-type gods which they had learned from the Greeks, and a complicated set of rituals for divining the future, which they handed down to the Romans and unlike most civilizations of the time, gender inequality seems not to have been very pronounced.